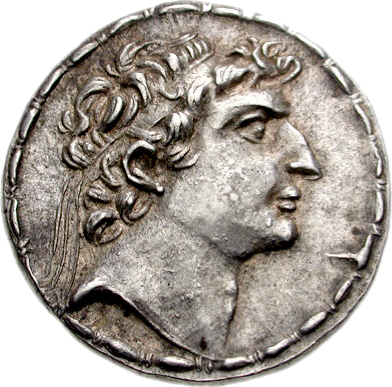 Seleucus VI was the oldest son of Antiochus VIII Grypus and his wife Tryphaena, and ruled the Seleucid Empire from 96-95 BC. In 96 BC, he defeated his half-uncle Antiochus IX Cyzicenus in revenge for his father's death. However, the score was evened the next year (95 BC) by Antiochus X Eusebes, the son of Antiochus Cyzicenus, and Seleucus was forced to flee from Syria to Mopsuestia in Cilicia, where he set up his court, allegedly in luxurious style. But the inhabitants of the province, who were already troubled by pirates, could not afford his extravagancies. Seleucus' efforts to set up a new army was a heavy burden as well. A rebellion broke out and Seleucus was besieged in the hippodrome, which then seems to have been burnt down along with the king and his men.